Yeah, you're laughing at this weird-looking half-egg-shaped concept car now, but when gasoline costs $10 a gallon not too long from now, this 330 mile-per-gallon Aptera concept car might start looking pretty damn good. It cops that high-mpg efficiency with a fuel-sipping diesel engine lashed onto hybrid technology, coupled with its wind-slippery aerodynamics and 850-pound weight. Stare at it long enough, and it starts looking like a lemon that's been cut in half. Will it be a lemon? 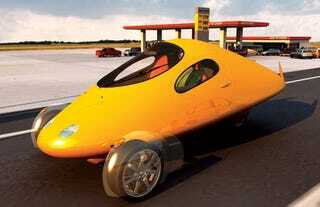 Wait a couple of years to find out, because the Aptera's designer, Accelerated Composites, says the three-wheeled fuel miser will hit the road by the end of 2008 at a sticker price of less than $20K.